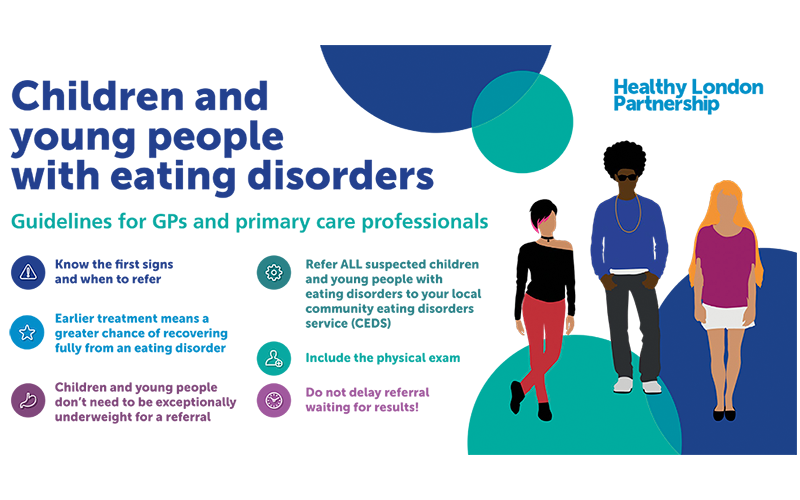 Healthy London Partnership has produced guidelines for primary care professionals about treating children and young people with eating disorders. The guidelines are being dispatched to GP practices across London to coincide with Eating Disorders Awareness Week. The eating disorders guidelines share advice about spotting the signs of eating disorders and when to refer children and young people (CYP) to the community eating disorders service (CEDS) for specialist support. Eating disorders are complex disorders that can have many underlying causes which tend to manifest during adolescence. There are multiple types of eating disorders and it is crucial to recognise the symptoms early on. “We are delighted to publish these guidelines for primary care professionals. They have been created in partnership with GPs, eating disorder specialists and Beat, the UK’s eating disorders charity. GPs told us they wanted clear information on how to manage and support children and young people with a suspected eating disorder, so we are pleased to be able to share these guidelines and ultimately help young people and their families access the treatment they need. Contact information for the seven London CYP community eating disorder services. The guidelines also include the Beat ‘Eating Disorders – Know the first signs’ resource, and information about Beat support services. Download our eating disorders advice for GPs and other primary care professionals. We would like to thank all those who have helped us develop these guidelines.